September 19, 2014 - School has started again, so our fast food trips have again slowed down. 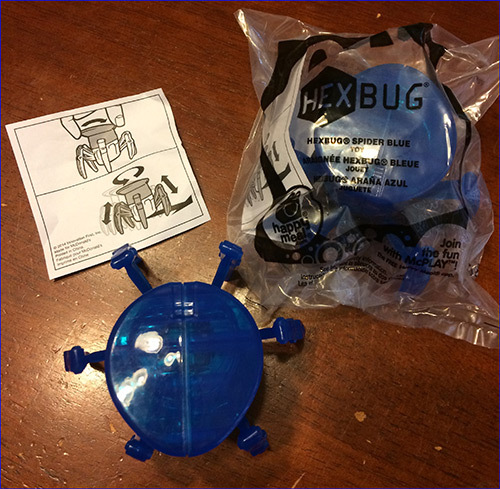 The boy didn't make any trips this past month, but I did go to McDonald's to pick up a Hexbug toy. They still had the display up for the previous promotion, so you get two pictures this time around, yay! September 7, 2014 - It's been a few months since we did this, so it is also time to check Target's printable coupons and Cartwheel app for new deals! August 22, 2014 - The boy made two trips to Wendy's this past month, but has zero interest in the two Kung Fu Panda toys he got with his food. He has already let me know to hand them out at Halloween. 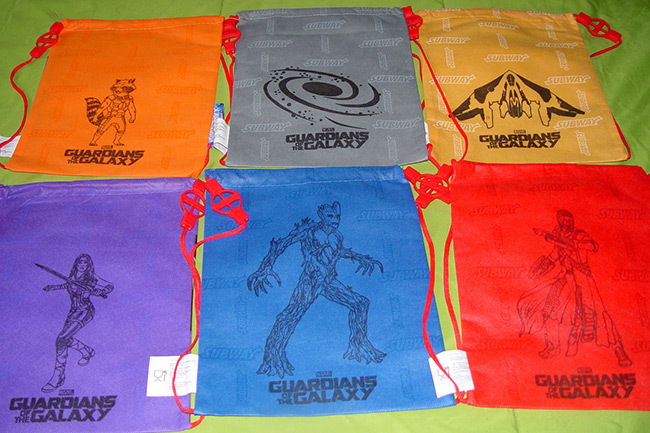 I bought a set of Guardians of the Galaxy drawstring backpacks from eBay because I wanted all six but I don't like Subway enough to eat there six times in a month. 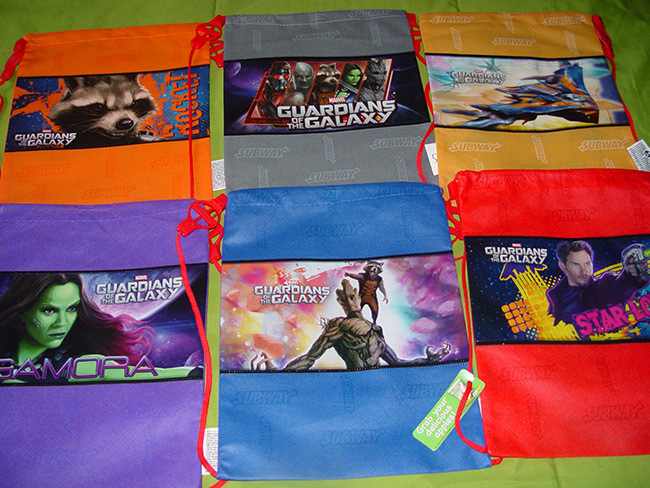 The bags are larger and nicer than I thought they would be. The fronts have pictures from the movie, while the backs have line drawings of the characters. July 22, 2014 - This seems to be a pattern - the boy made just one visit to fast food in the past month, choosing to get his chicken nuggets out of the freezer at home instead of in a retaurant. He came back from his one McDonald's trip with a Mario Kart 8 toy. 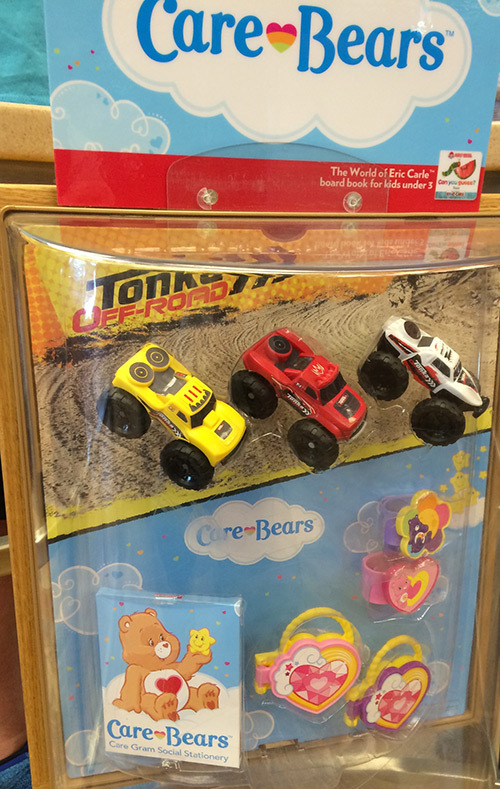 - McDonald's has toys from Mario Kart 8 and Teenie Beanie Boos in their Happy Meals. The next promotion shown is a joint promo of HotWheels and Barbie. Their McPlay app now has free ebooks in it as well as a game. The ebooks are also available on their web site. 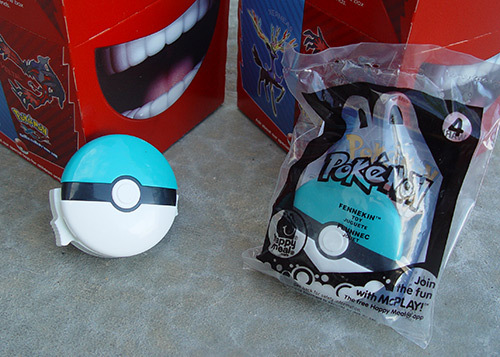 June 16, 2014 - Once again, the boy made just one visit to fast food in the past month, scoring a pair of Pokemon toys at McDonald's. 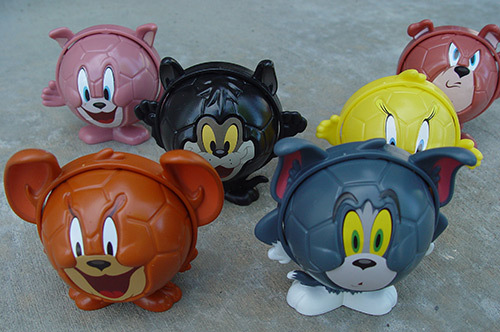 He also talked me into a set of Burger King's Tom and Jerry toys via eBay. - McDonald's has toys from How to Train Your Dragon 2 in their Happy Meals. 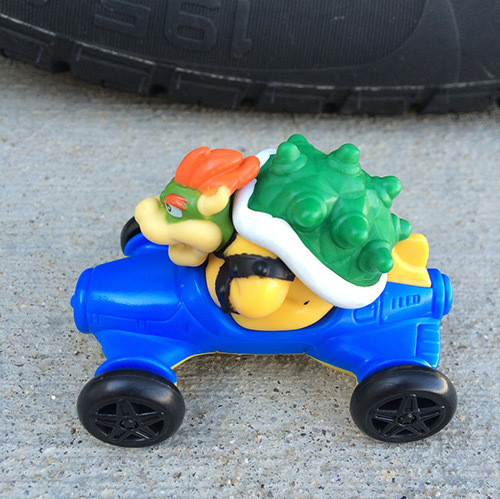 The next promotion shown is a joint promo of Mario Kart 8 and Teenie Beanie Boos. May 14, 2014 - The boy made just one visit to fast food this past month, but scored two Spider-Man movie toys: Spider-Man and Electro action figures. They are articulated only at the shoulders, but do have light-up features. They have buttons on their backs to press and make their heads light up. 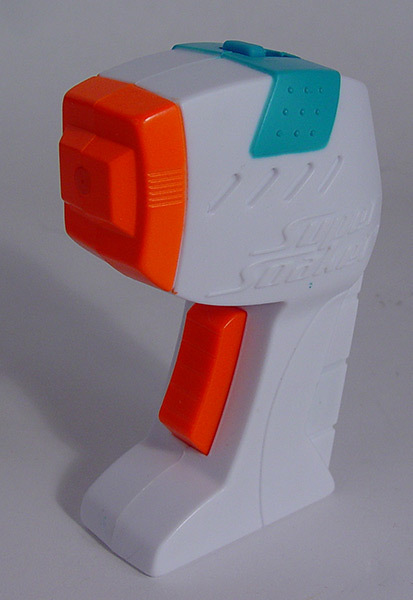 We also unearthed this gem from 2011 - a wee Super Soaker from a Burger King promotion. It was hiding out in a box of regular-size squirt guns in our pantry. 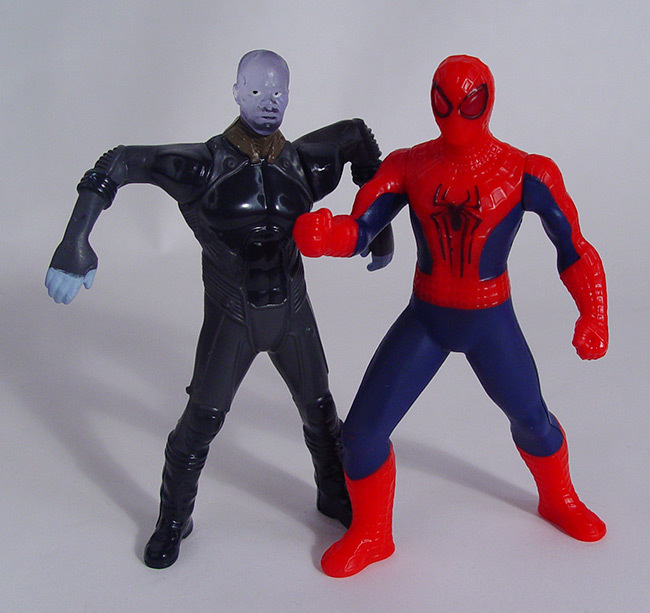 - McDonald's has toys from The Amazing Spider-Man 2 in their Happy Meals. The next promotion shown is a joint promo of Pokemon and American Girl: Isabelle. April 2014 - CustomCon 37 has arrived! A one day show with a variety new custom action figures for you to enjoy. Please use the links below to navigate around the 'show' or take a look back at previous CustomCon events. April 16, 2014 - The boy missed out on fast food entirely this past month, but he has caught on to the concept of eBay and has requested sets of several recent promotional toys. 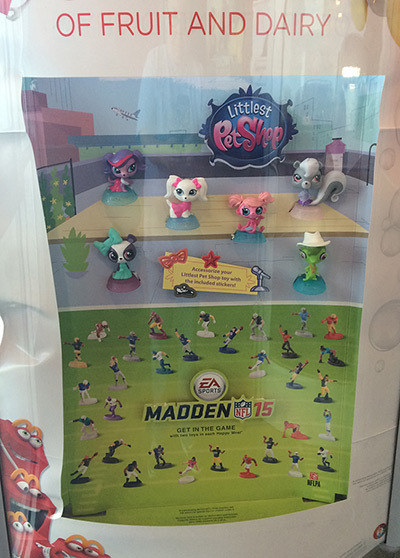 - McDonald's has toys from Skylanders Swap Force and My Little Pony: Rainbow Power in their Happy Meals. The next promotion shown is The Amazing Spider-Man 2, with toys for boys and jewelry/goodies for girls. March 21, 2014 - We've done a fair bit of traveling in the past month, and from McDonald's, the boy scored another lenticular cup from The LEGO Movie and two Mr. Peabody and Sherman toys, as well two of the mini Hasbro Games from Wendy's. 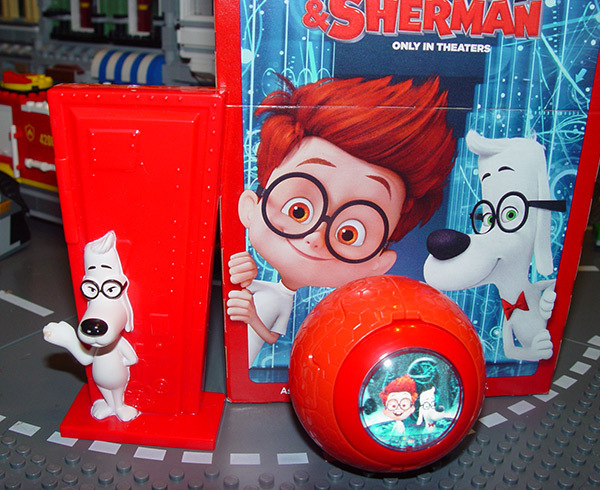 - McDonald's has toys from Mr. Peabody & Sherman in their Happy Meals. The next promotion shown is a combination of Skylanders Swap Force and My Little Pony: Rainbow Power. Their McPlay app now has free ebooks in it as well as a game. The ebooks are also available on their web site. What is CustomCon, you ask? CustomCon is a special semi-annual presentation of new custom toy creations by customizers around the globe. More than a decade in the running, it's still going strong. Inspired by the presentations of new product by legitimate manufacturers at Toy Fair and other trade shows, CustomCon is a "fake" convention, whereby customizers present their latest creations and recipes as if unveiling a new line of real toys to retailers. It's always a lot of fun, for both the viewers and the participants. If this is your first exposure to a CustomCon, click here to see what's been offered over the past 36 CustomCons. EVENT DATES: CustomCon 37 will run from April 21 to 25, 2014. ENTRY DEADLINE: The deadline will be Monday, April 7, 2014. No entries will be accepted after this date.